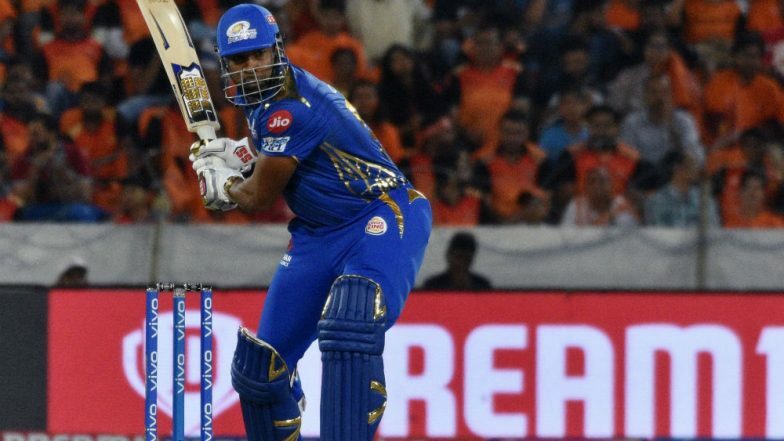 Sunrisers Hyderabad (SRH) and Mumbai Indians (MI) are playing against each other in the match no 19 of VIVO Indian Premier League (IPL), 2019. Mumbai posted a total of 136/7 in 20 overs. MI batsman Kieron Pollard hits a one-handed in the 19th over on SRH bowler Siddharth Kaul, which have left us stunned. Mumbai Indians vs Sunrisers Hyderabad Live Cricket Score 19th T20 Match. Sunrisers Hyderabad skipper Bhuvneshwar Kumar opted to bowl after winning the toss. Mumbai had a lousy start where their skipper Rohit Sharma was the first one to get dismissed by SRH spinner Mohammad Nabi. The SRH all-rounder Nabi finished with the figure of 13/1 in 4 overs. SRH leg-break spinner Rashid Khan also bowled with a good economy with figures of 1/27 in 4 overs, where he took the crucial wicket of Hardik Pandya. Kieron Pollard played a handy unbeaten knock of 46(26) where he was dropped by Rashid in the 18th over. This sloppy fielding proved costly, as Pollard went on to smash 20 runs in the 19th over on the bowling of Siddharth Kaul. Watch Video of Pollard's one-handed six in the first bowl of Siddhart Kaul's 19th over. Mumbai Indians' Ishan Kishan Run Out in an Unusual Way After SRH Wicket-Keeper Jonny Bairstow Knocks the Bail off Before Collecting the Ball! Watch Video. MI all-rounder Pollard indeed gave his team the opportunity to defend the total of 136 on this track which is assisting bowlers. Sunrisers Hyderabad will be disappointed with their fielding efforts, as they dropped catches and misfielded at many occasions. SRH was riding high, until last three overs, where they let themselves down by some bad execution. Mumbai Indian can fancy their chances on this track, especially when they have a bowler like Jasprit Bumrah in their side. Stay tuned to our website-Latestly for more updates.